The Hellenic moto Guzzi club is a club founded in 1995. It has it’s establishment in Athens and has 70 members. All our members owns at least one Moto Guzzi bike. Our fleet has 12 V7 most of them ex police, 10 Le Mans I,II,III , 5 California , 1 Daytona , 4 Quota and many V35,V50,V65 . 1. Find our own establishment (at the present time we are together with the club of Classic motorcycles in Thission area close to Acropolis). 2. 36 Hours tour of Greece in May. 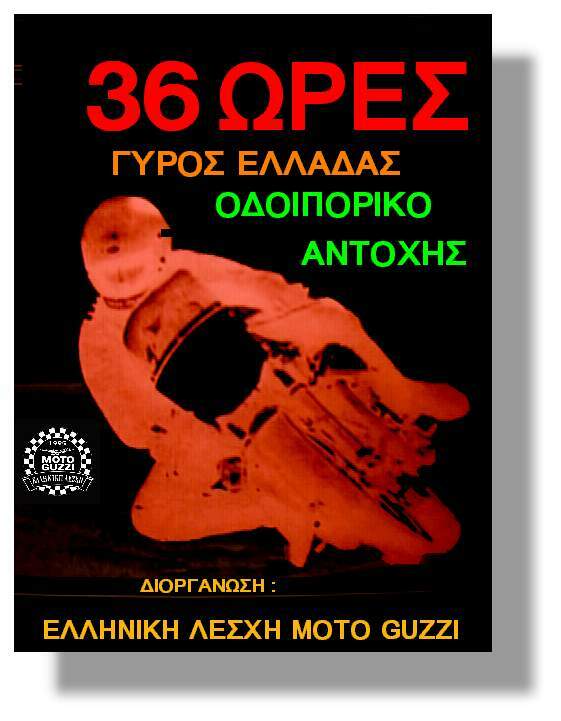 An endurance tour of Greece Organized from our Club non Guzzi motorcycles are also welcome. It is a tour through all mainland distinct in 36 hours passing through very nice places as, Korinth channel, Ioannina town, Katara pass in the Mountains, Meteora where the nunnery are in top of a cliff ,Kastania forest , Thessaloniki town , Kavala town and ending the first day in Xanthi town the way back is through Thessaloniki town, Tembi pass Thermopiles and ending in Athens wich is also the starting point. All together approximately 2000 Km most of them in country roads and national roads. 3. Participation in the Classic trophy organized from classic motorcycles club, where you may see some very nice oldies among them our V7’s. May 98. 4. In June is the National meeting in Drepanon close to Igumenitsa where more than 2000 bikes will arrive from all over Greece, with live music a lot of drinks and good food. If you are about to Travel in Greece about that time it is worthy to visit this happening. 5. In September some of us will go to the International meeting in Mandelo del Lario .